Skier’s Thumb, or Gamekeeper’s Thumb, is a tear of one of the ligaments that stabilizes the joint in the middle of the thumb. These tears are treated by Dr. Peter G. Fitzgibbons, MD at The Centers for Advanced Orthopaedics: Maryland Orthopedic Specialists Division. Dr. Fitzgibbons performed fellowship training in hand, wrist, and elbow surgery through the Harvard Hand & Upper Extremity Fellowship based at Brigham & Women’s Hospital in Boston. 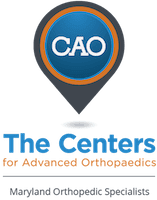 With office locations in both Germantown and Bethesda, Maryland, he and a team of orthopaedists, hand therapists, and physical therapists offer a comprehensive range of services covering the diagnosis, treatment, and rehabilitation of skier’s thumb. What exactly is Skier’s Thumb? Skier’s thumb is a ligament tear in the thumb. This ligament, the ulno-collateral ligament, is a key ligament in the function of the hand because every time you grasp something in your hand this is the ligament that keeps your thumb stable. When it is torn the symptoms are swelling, stiffness, and pain with grasping and pinching. How is Skier’s Thumb treated? When the ligament is injured it is sometimes just stretched out or partially torn, and these injuries can be immobilized in a splint or cast, usually for at least 6 weeks, in order to heal. If the ligament looks like it might be completely torn, an MRI is usually obtained to assess the degree of the tear and whether or not the ligament is resting in a position that will allow for normal healing. If not, surgery is sometimes performed to repair the ligament back down to the bone. What is surgery to repair Skier’s Thumb like? Surgery to repair the ligament is an outpatient procedure and is usually, but not always, done with general anesthesia. Dr. Fitzgibbons performs most of these procedures at the Massachusetts Avenue Surgery Center, an outpatient surgery center that provides a safe, patient-oriented experience in a friendly and comfortable environment. Afterward, the thumb is immobilized for four weeks and then hand therapy is begun under the direction of Stephanie Clement, CHT, our certified hand therapist.